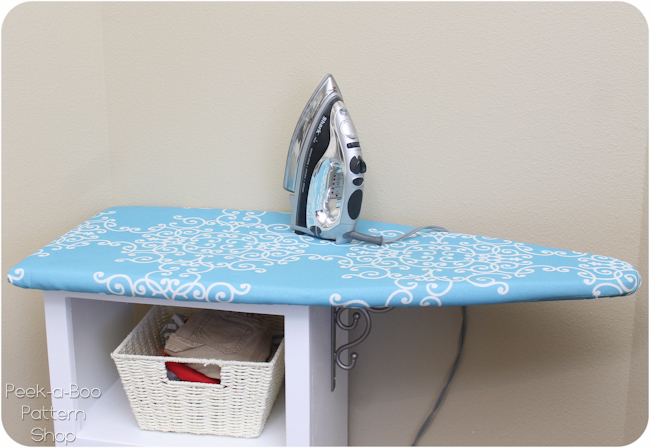 Ironing Station: The DIY customized fabric ironing board tutorial. 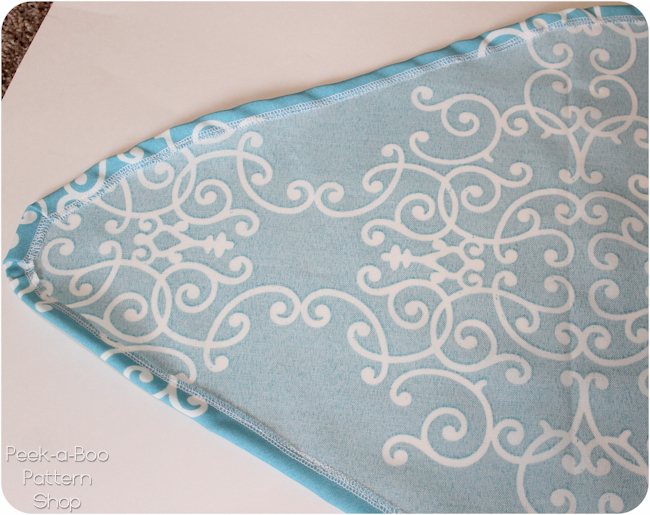 Pressing is an essential step in sewing and I used to HATE it. With 2 toddlers in the house I couldn’t ever leave my ironing board out without worrying about them knocking it down and getting clunked in the head with an iron. Not to mention that ironing boards are huge and my office really doesn’t have room for one. Amazing husband to the rescue! 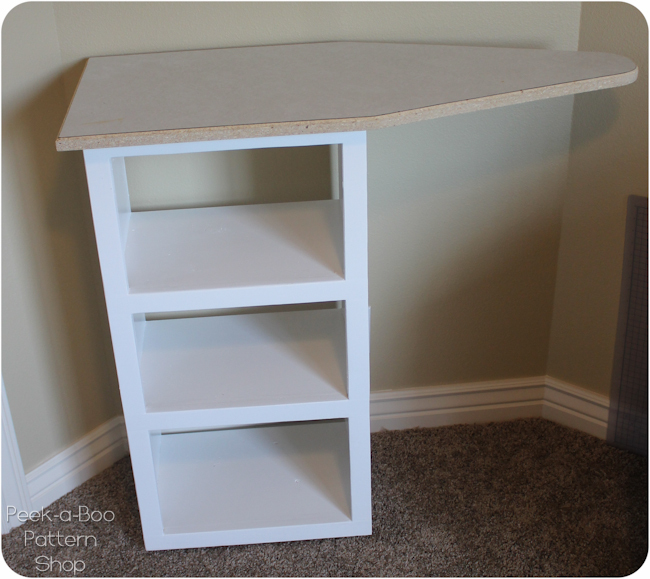 He built a simple shelving unit with a wood ironing surface (MDF) on top. It’s braced underneath the ironing board overhang and bolted into the wall to keep it from tipping. I have a simple iron holder mounted on the wall to keep my iron safely out of reach when not in use. I use the hooks meant for the ironing board for my spray bottle and cord and quite often I hang a pair of scissors there as well. If you’re building your own fabric ironing station, you can of course choose whatever dimensions you’d like. My station has shelves that are 17″ wide x 33″ tall x 12″ deep. The ironing surface is 36″ long x 15″ wide. 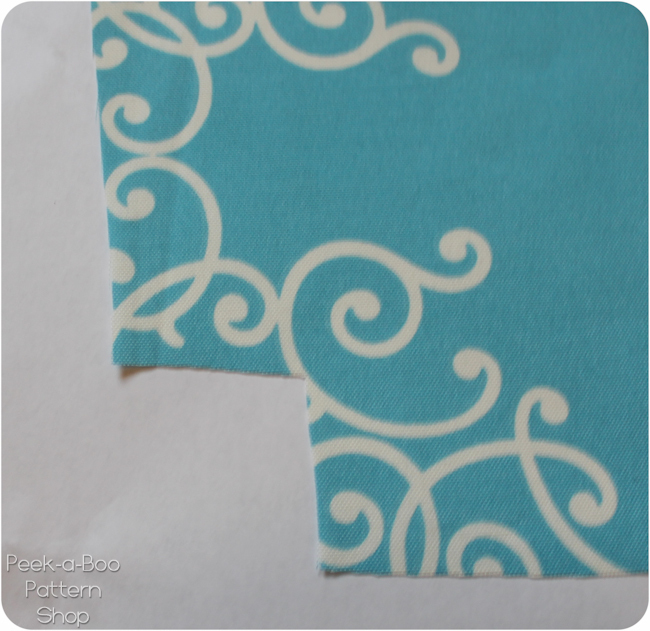 This is a perfect size for most of the pressing I do with children’s clothes and smaller fabric cuts. If you mostly work with larger pieces of fabric you may want a larger work space. Once the base was built I took over the rest of the project 🙂 I wrapped the entire ironing board in batting to give it a little cushion. 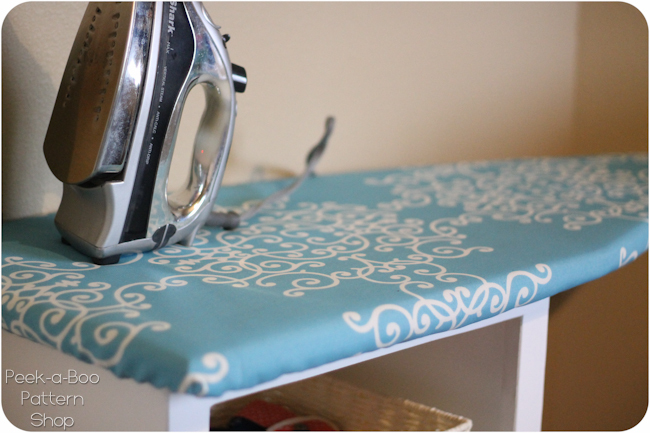 Next I made a pretty cover for the fabric ironing station using home decor fabric. 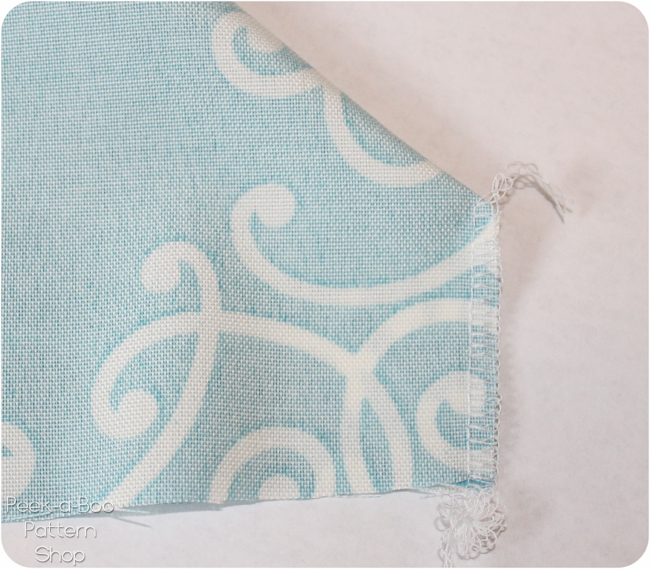 I just laid my fabric over the ironing board and cut around it leaving a 3-4″ overhang. Next I serged my edges and folded over 1/2″ to make a casing. You’ll notice there’s quite a few little tucks and gathers along the corners and that’s fine. It will all be on the underside of the ironing board. 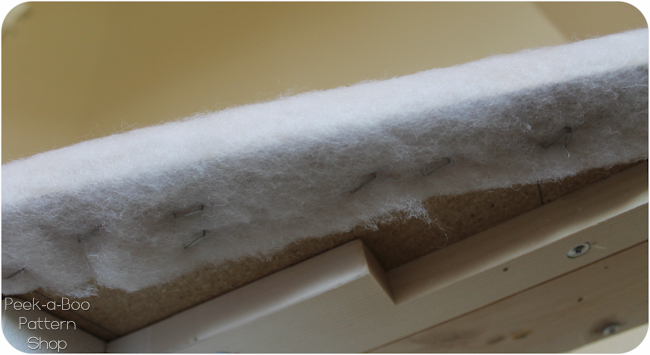 Thread some 1/4″ elastic or elastic cording through the casing and try it on the ironing board. Pull until it’s snug and secure your ends (I used cording so I just knotted). And it’s ready to go! 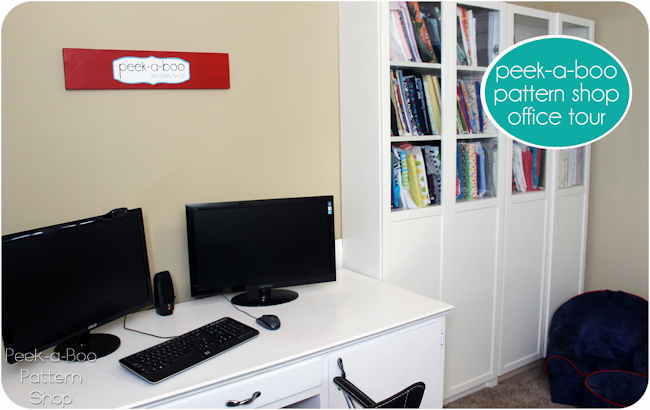 Previous Post: « Sewing Studio Tour at Peekaboo Pattern Shop! Love this! I was looking for a way to tuck a portable ironing board under a table. This is perfect! I am going to cover mine in a large check pattern so I can also have a visual measurement while working. An idea for how it would work nicely for me: Since I do not have a separate sewing room (or much extra room at all), this would be nice to set up on casters (that lock). Then it can move from a closet or spare bedroom where it could be ‘stored’ to the room where I’m sewing! I’m going to go look for an old wooden ironing board at a thrift shop. Maybe I could mount the top of that onto a shelf unit. I don’t have a handy husband to make me a top. This is great! Where did you get the iron holder hanging on the wall? 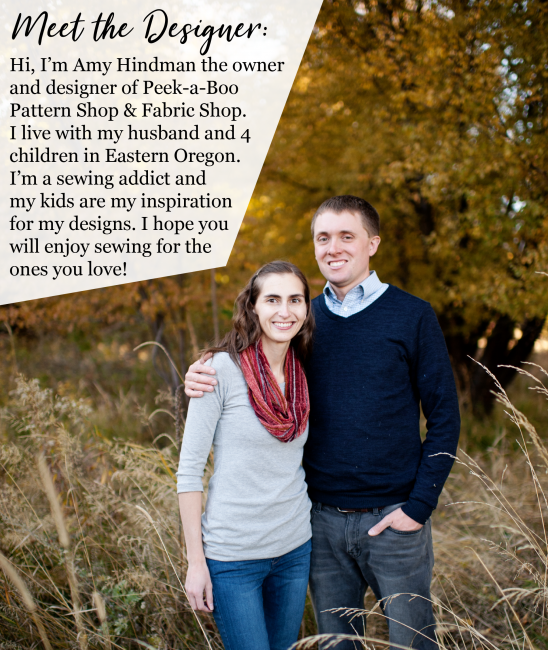 Love this Amy! 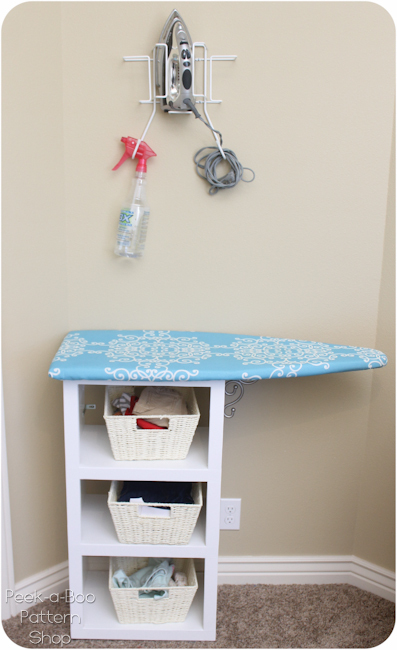 I’ve been looking into buying a tabletop ironing board and hadn’t even thought of making my own! Duh! Thanks for the inspiration…looks great! I love it! I want one now. 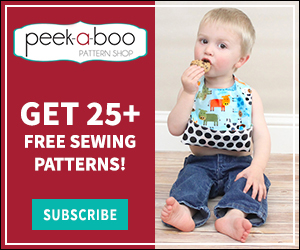 Those baskets would be a great UFO station to put projects you have cut and ready to sew! Great idea! Love the little one, but I’m going to tear apart my big board to make a larger one with two storage units underneath, too. I will finally get a stable board. I really like that you made the cover removable! I don’t know that ironing boards get that dirty, but it’d be nice to switch out for new fabric for a small and easy change. Of course if it does get dirty, taking it off to put it in the laundry would be a dream! I wish I did this for our homemade changing table when my girl was a baby. Now I think maybe I might do something like this with baby #2. Anyways, that’s not about ironing boards. I love your space and if I had a setup like yours, I’d probably press more too! Great idea!